A brand new art gallery might be expected to get off to a slow start—especially one with a debut exhibition called “Tentatively Titled”—but there’s nothing tentative or hesitant about Sunday Project, one of Pilsen’s newest galleries. Although an aura of freshness hangs around the tiny, comfortable gallery space with its newly-painted white walls and sleek hardwood floors, there’s no doubt that Sunday Project will soon be fully incorporated into the map of Pilsen galleries. In its opening show, the gallery tackles complex themes and highlights the works of artists from all over the country. Morgan Manduley, owner and curator of Sunday Project, decided to open the new space in Pilsen to showcase emerging artists and form new connections among their work. Although creating Sunday Project required a huge investment of both time and money, he says there’s nothing else he would rather be doing. For years, Manduley had been busy creating his own art as a student at the San Francisco Art Institute and later the School of the Art Institute of Chicago. During this time, he met an assortment of artists who differed in everything from age, to background, to choice of medium. Manduley wanted to create a space where he could bring these artists together so that their works could complement, highlight, and strengthen each other. With experience serving on the curatorial committee at Space 4 Art in San Diego, California, he sought to execute this vision once he moved to Chicago. 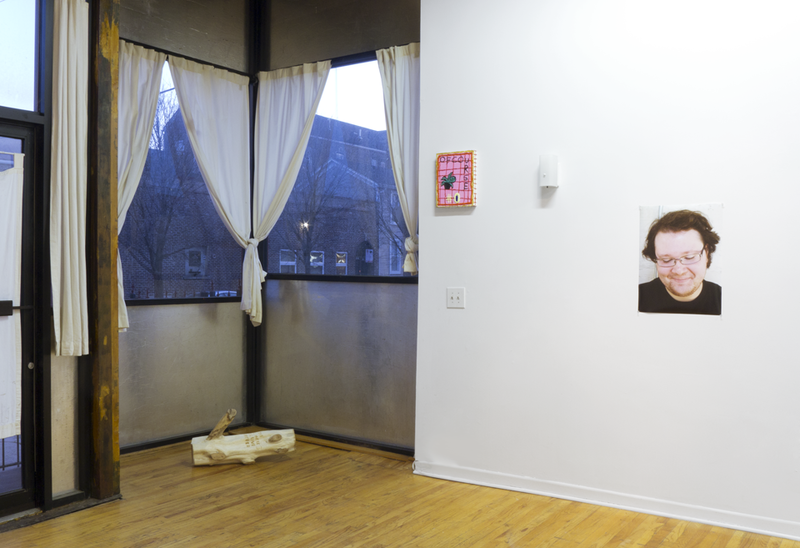 The entire laborious process of starting up a gallery—which included planning, reaching out to fellow artists, and renting out and renovating the apartment space in Pilsen—took about a year. In the end, Manduley believes that the act of assembling these artists in the Sunday Project space will allow for exploration of new themes as well as deeper analysis of art’s potential as a tool for self-awareness and introspection. He wanted the gallery’s first show, “Tentatively Titled,” to explore this inner, personal thought process behind creating art. “These artists turn the lens on themselves. They explore aspects of monotony and life that are often overlooked by others. In a way, many of their pieces function as personal diaries that are then shared with the world,” Manduley says. Perfectly capturing the banality of everyday existence, one featured work in the exhibition is a looping video by Elliot Mickleburgh called “Driving in My Hometown in My Mom’s Station Wagon Singing Along to All of Weezer’s Blue Album” The footage is focused on Elliot’s face as he drives aimlessly through the suburbs, singing boisterously along to the music, bobbing his head up and down. This universal experience—an uneventful and (usually) undocumented journey between destinations—is just one of many showcased by these artists. In the future, Manduley hopes that Sunday Project will continue to serve as a connecting point for artists from all over the world. The gallery’s current exhibition, “Havisham,” features three artists from Mexico City, San Diego, and California. They too explore the process of making art, but with a focus on the viewer-artist relationship rather than introspections of the artists themselves. Although it may be a tiny new gallery camouflaged among countless other red brick buildings that flank Pilsen’s outer streets, Sunday Project is a space that will undoubtedly develop into an intimate epicenter for new ties and shared musings.